The world's GDP in 2009 will shrink for the first time since WWII, according to the World Bank. Poor developing nations will be particularly hard hit with a shortfall of $270 billion to $700 billion, which will set them back by many years. Many of these nations are looking for help from the traditional donors in the West. But the West itself is preoccupied by its economic woes, with tent cities popping up all over the United States as home foreclosures rise. According to the latest estimates of the World Bank, almost 40 percent of 107 developing countries are highly exposed to the poverty effects of the current economic crisis, less than 10 percent face little risk and the remainder are moderately exposed. Bangladesh, India, Nepal and Pakistan are ranked among the 43 countries most exposed to poverty risks, raising the horrible specter of further political instability and dangerous social strife in a very important region of the world. As one of the developing nations facing a serious economic crisis, Pakistan has received International Monetary Fund's commitment of $7.6 billion rescue package. But it needs more help. China refused cash aid to Pakistan during last month's China visit by President Asif Ali Zardari to seek financial assistance. At the time, many press reports inaccurately said that Zardari returned empty handed. Instead of cash aid, the Chinese offered $450 million to Pakistan as suppliers’ credit for Neelum Jhelum Hydroelectric Project during Zardari's visit. China and Pakistan also signed specific agreements to help Pakistan on a number of other water and power development projects. Prior to these agreements, China has been helping Pakistan in many infrastructure projects such the Gwadar port and a number of nuclear power plants. Looking at how the Chinese are working with many developing nations in Asia and Africa, it appears to be an unwritten Chinese policy to offer trade and investment in projects rather than direct cash aid. Given the rampant government corruption in many developing nations, including Pakistan, the Chinese policy is a sound one. It attempts to benefit the people and the nation more than the corrupt politicians and government officials who they must deal with. The Chinese government recognizes the crucial role it must play to lead the world out of the current economic crisis. Not only has it announced significant stimulus spending, it is also continuing to lend to the United States to help in America's recovery back to health. Together, the US and China have become the twin locomotives pulling the global economy. The combined behemoth of China and America has been labeled by Harvard business school professor Niall Ferguson as "Chimerica". Ferguson believes "we are living through a challenge to a phenomenon Moritz Schularick and I christened “Chimerica.” In this view, the most important thing to understand about the world economy over the past decade has been the relationship between China and America. If you think of it as one economy called Chimerica, that relationship accounts for around 13 percent of the world’s land surface, a quarter of its population, about a third of its gross domestic product, and somewhere over half of the global economic growth of the past six years." Along with helping the US economy recover, China has a unique position and policy to help the developing world at the same time. Not only does the West have the white man's colonial baggage to contend with, the western view of Africa is one of wasted aid and growing poverty. This view holds that, if Africa generates any kind of growth, it is in suffering—and in the overseas aid sent to address that, now a $40-billion-a-year industry, according to Time Magazine. Naturally, with a new appeal every year and a new disaster every other, some people are feeling donor fatigue. They have begun to wonder if all that money is doing any good. They argue that aid creates dependence, fuels corruption, undermines democracy and stifles development in Africa and some of the poor underdeveloped nations in Asia and Latin America. Learning from the western experience, the Chinese have sought to avoid fueling the culture of corruption and dependence by staying away from cash hand-outs. Instead, the trade between Africa and China has grown an average of 30% in the past decade, topping $106 billion last year. Chinese engineers are working across the continent, mining copper in Zambia and cobalt in the Democratic Republic of Congo and tapping oil in Angola, according to Time. Nor is this merely exploitative. China bought its access by agreeing to create a new infrastructure for Africa, building roads, railways, hospitals and schools across the continent. The current economic crisis is not expected to affect China's march in Africa: on the contrary, with the West's plans in Africa on hold at best, Beijing views it as an opportunity to extend China's lead. "We will continue to have a vigorous aid program here, and Chinese companies will continue to invest as much as possible," Chinese Foreign Minister Yang Jiechi said in South Africa in January. "It is a win-win solution." Dambisa Moyo, who wrote Dead Aid, says those who need convincing about Africa should ask themselves if they are convinced about China, "because if you back China, you're backing Africa." Ecobank CEO Ekpe says part of the explanation for China's zeal for Africa is a new way of looking at Africans. "[The Chinese] are not setting out to do good," he says. "They are setting out to do business. It's actually much less demeaning." Clearly, the Chinese objectives are not entirely altruistic. Their strategy is driven by enlightened self-interest in the developing world, which they see as source of commodities that their industries need as well as growing export market for their products and services. But the Chinese want to do good and do well at the same time by helping to lift people out of poverty in the developing world. By doing so, they want to be seen as friends and partners by the people in Asia, Africa and Latin America. The strategy enhances China's status as the new superpower that takes its global leadership role seriously. I think the whole idea of looking at African countries as some pawns in these superpower games is sickening. They really should have their own elected governments who can decide what trade and foreign policies they pursue. It is interesting to see the difference in attitudes towards trade with China in non-democratic African nations versus the democratic ones. Why are the democratic countries not doing business with China ? Unfortunately, many of us have been brainwashed by our former colonial rulers into seeing everything with the filter of "democracy". The fact is that the colonial powers have been promoting a culture of corruption and dependency that manifests itself in terms of widespread poverty and hunger in sub-Saharan Africa and South Asia, particularly including India. The fig leaf of democracy can not hide this shame. China has done well by not being swayed by the empty slogans of democracy and focused on industrialization to pull itself and others out of the colonial legacy of economic deprivation. Mr Haq, the countries I mentioned are the ones that are doing relatively well in Africa. Ghana , for example ranks well above China and India in the corruption perceptions index. The countries that you said are 'dealing' with China are prime examples of the pervasive corruption. In fact, the Chinese state is itself highly corrupt. You have not answered my question, why are elected governments in Africa not dealing with China ? What democracy means to India and myself is an entirely different discussion that is not relevant here. You ask "why are elected governments in Africa not dealing with China ?" I don't agree with the premise of your question. I think your question of elected or not is just a red herring here. 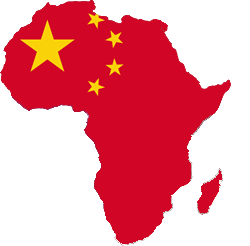 As far as I know, many African governments, regardless of being elected or not, welcome Chinese assistance. But that doesn't mean China wants to work with whoever welcomes aid from or trade with China. Chinese, like any other nation, have their own priorities. The bottom line is that their way of helping with projects and trade rather than cash aid does not promote a culture of corruption and dependence. Okay let me rephrase the question, why is China mostly dealing with only corrupt or authoritarian regimes like the one in DRC ? Are you sure that western assistance to African nations never involved large infrastructure projects ? Western countries are the principal trading partners of the African continent as a whole, so its wrong to say the West never promoted trade with Africa. I think your assertion about promoting 'cultures of corruption' requires re-examination. Corruption thrives in the absence of accountability. And accountability is what western governments often ask for, and China doesnt. By selectively bringing democracy and human rights discussion into the equation, you are falling for the Western propaganda against China. The fact is that China's help model is proving to be much more effective than the Western model which out a lot of the bad and corrupt dictators in power to serve their former colonial masters. The Western supported puppets have been guilty of tremendous abuses in Africa. China doesn't have that baggage. Like any other nation, China's relations with Africa are based on China's needs, whose economy is energy hungry. Eighty-five percent of Africa's exports to China come from five oil-rich countries (Angola, Equatorial Guinea, Nigeria, the Republic of Congo, and Sudan), according to the World Bank. China is now the second largest trading partner of African continent, just behind the US, but with 45% increase from 2007 to 2008 its trade is growing much faster and will soon surpass US trade with Africa. BTW, India tried and failed to get Angolan oil deal. If democracy is so important to India, why did it want the Angola deal? Or why does it do business with many authoritarian regimes? Well your point about India just reiterates my own. A state that is itself corrupt will not demand accountability from other states. This is why both India and China deal with monsters like the regime in Burma. On Transparency International index, both China and India are equally corrupt, notwithstanding India's democracy. In practice, the Chinese have been able to pull off an impressive industrial revolution lifting more people out of poverty than any other nation in recent history. I do disagree with China on their Sudan policy, but I do understand that they do not want to be self-righteous like the West, which has done far more damage by colonizing and then intervening repeatedly on behalf of their dictators of choice. The West has been guilty of assassinating African leaders such as Congo's Lumumba, and sustaining Apartheid in South Africa for far too long while benefiting from the minority White regime's policy of supplying raw materials. The US, a democracy, has also behaved badly by thwarting democracy in Iran, Chile and many other places and repeated military interventions/invasions in Central America, South America, Asia and the Middle East. As far as China being a better provider of aid and trade to Africa, the fundamental point I make in my post is that the Chinese do not hand out large amounts of cash, their help is mostly in kind. But they make no demands on the recipients by imposing their culture or values on them. Dambisa Moyo, a former economist at Goldman Sachs, and the author of "Dead Aid: Why Aid Is Not Working and How There Is a Better Way for Africa. ", recently argued in a Wall Street Journal OpEd that "money from rich countries has trapped many African nations in a cycle of corruption, slower economic growth and poverty. Cutting off the flow would be far more beneficial." He goes on to say, "Giving alms to Africa remains one of the biggest ideas of our time -- millions march for it, governments are judged by it, celebrities proselytize the need for it. Calls for more aid to Africa are growing louder, with advocates pushing for doubling the roughly $50 billion of international assistance that already goes to Africa each year. Yet evidence overwhelmingly demonstrates that aid to Africa has made the poor poorer, and the growth slower. The insidious aid culture has left African countries more debt-laden, more inflation-prone, more vulnerable to the vagaries of the currency markets and more unattractive to higher-quality investment. It's increased the risk of civil conflict and unrest (the fact that over 60% of sub-Saharan Africa's population is under the age of 24 with few economic prospects is a cause for worry). Aid is an unmitigated political, economic and humanitarian disaster." In what is the biggest foreign investment in Afghanistan, China last year committed nearly $2.9 billion to develop the Aynak field including the infrastructure that must be built with it such as a power station to run the operation and a railroad to haul the tons of copper it hopes to extract. Despite Afghanistan’s deteriorating security including in Logar province which is where the Aynak reserves are located and which serves as one of the gateways to Kabul, China has said it will carry out the project, the Afghan mines minister Mohammad Ibrahim Adel said.